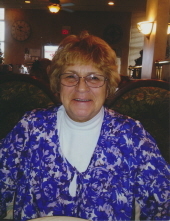 Carol A. Johnson nee Kalec, age 73, a longtime resident of Plainfield, formerly of Berwyn, IL passed away on February 9, 2019. She was born February 10, 1945 in Chicago, IL. Carol is survived by her children George (Patricia) Reitz, Edward (Cindy) Boliaux, Brandi (the late Robert) Webb, and Elaine Fleck; grandchildren Jeremiah Reitz, Sarah (Jason Witnik) Reitz, James Reitz, Eric Reitz, Makayla Boliaux, Kylan Boliaux, Christopher Mester, Brian Mester, Gracie Webb, Morgan Webb, Elyse Fleck, and Emma Fleck; great-grandmother of Attiana, Emily, Joshua, Alyssa, Jason, Adam, Cassidy, James, Madelyn, and Jackson. She is preceded in death by her husbands George Reitz, Edward Boliaux, Jesse Flores, and James Johnson; parents Elaine and Stephen Kalec; sister Dorothy Liebman. Visitation will be Thursday, February 14, from 3:00-9:00 PM at Overman-Jones Funeral Home & Cremation Services 15219 S Joliet Rd. Plainfield, IL 60544. A Mass of Christian Burial will be on Friday, February 15 at 10:00 AM at Holy Family Catholic Church 600 Brook Forest Ave. Shorewood, IL 60404. Interment will be at Fairmount Willow Hills Cemetery, Willow Springs, IL. To send flowers or a remembrance gift to the family of Carol A. Johnson, please visit our Tribute Store. "Email Address" would like to share the life celebration of Carol A. Johnson. Click on the "link" to go to share a favorite memory or leave a condolence message for the family.